The hypothesis of significant effect of cosmic-rays to climate has been shown wrong many times. This is a pet hypothesis of Henrik Svensmark, who continues to push papers on the subject to scientific journals. A few days ago, the journal Nature Communications published a paper of Svensmark (& co-workers). I checked out its reference list because I think that some indicators of the quality of a paper can be found simply by checking the reference list, and how references are used. The Kulmala et al. paper I mention there is this one: “Atmospheric data over a solar cycle: no connection between galactic cosmic rays and new particle formation”. It shows results against Svensmark’s hypothesis, but it is not cited by S17. The mentioned paper list in my tweets is this one: “Papers on the non-significant role of cosmic rays in climate”. (Note added December 27, 2017: This paragraph is incorrect – S17 cites two Laakso et al. papers and I somehow got them mixed.) One Kulmala team paper S17 cites is “Detecting charging state of ultra-fine particles: instrumental development and ambient measurements” (Laakso et al. 2007). 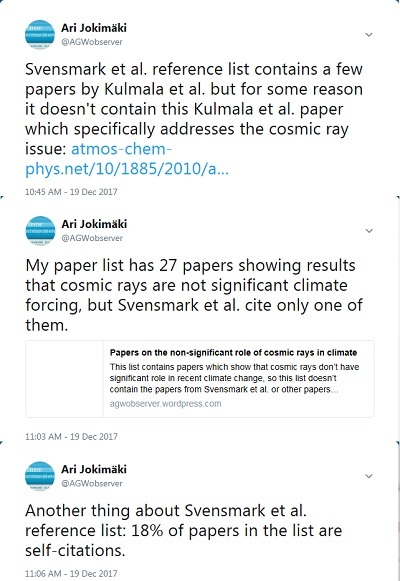 S17 uses it in this context: “Cosmic rays are the main producers of ions in Earth’s lower atmosphere21.” (21 is the S17 reference list number for the Laakso et al. paper.) This is strange because Laakso et al. don’t say anything about cosmic rays. Cosmic rays are mentioned only in their reference list in the title of Eichkorn et al. (2002) paper, and Laakso et al. refer to it in this context: “Ion mass spectrometers have been used successfully in the studies of new particle formation in the upper atmosphere (Eichkorn et al., 2002).” Furthermore, as Svensmark’s cosmic ray hypothesis relies on ion induced nucleation, it is noteworthy that one of Laakso et al. conclusions is this: “During a large fraction of days considered here, the contribution of ion-induced nucleation to the total nucleation rate was either negligible or relatively small.” To me it seems that either S17 is citing a wrong paper here, or then the cosmic ray ion production thing is implicitly in Laakso et al. results and I just don’t see it. I decided to look S17 reference list further. I chose a comparison paper, Gordon et al. (2017, “G17”), which is a research paper on the same issue than S17. Both papers have been published and submitted to their journals during 2017, S17 in May 10 and G17 in March 24, so S17 is a bit newer in that sense. S17 was published in December 19 and G17 in August 24, so also in that sense S17 is newer. I emphasize newer here because it suggests that references in S17 reference list should be as new or newer as references in G17 reference list. The reference list of S17 contains 39 entries while the reference list of G17 contains 85 entries. As the papers are on the same subject, it seems that S17 reference list is a little short. However, scope of G17 seems to be somewhat broader, so reference list length doesn’t necessarily tell anything. It is quite clear from the graph that S17 reference list focuses on older papers than G17 reference list. highest peak of temporal distribution of S17 is 2005-2009, while corresponding highest peak of G17 is 2010-2014. 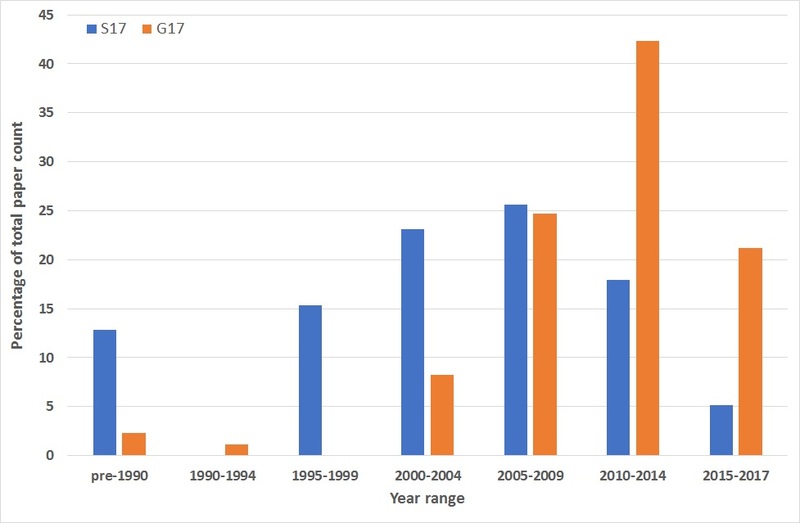 Also, G17 distribution is rather sharply concentrated on the more recent times, while S17 distribution is more spread out in time, and it almost seems as if the most resent research is being avoided in S17 reference list (the share of 2015-2017 papers is very low in S17 compared to G17).